Private Internet Access doesn't have a pretty interface, but this no-frills VPN gets the job done at a good price. Private Internet Access (PIA) has a reputation for protecting its users—a reputation that was bolstered in early 2016. At the time, reports of a criminal complaint in Florida surfaced. Looking for information about a suspect issuing threats and bomb hoaxes, the FBI demanded logs from PIA in connection to its investigation. The complaint states that PIA was unable to provide the investigations anything substantive. I point this out not to celebrate that PIA protected an accused criminal but to note that PIA had its logging policy tested in court and came out on top. That’s good news for the rest of us regular citizens who just want to keep our service providers out of our business. Before we dive in to this VPN, I must disclose that PIA is currently my personal VPN service provider. Every year or two, I like to switch providers to get an extended sense of their services, and PIA is the provider I’m paying for currently. Private Internet Access’ minimalistic interface is accessible from the system tray. Unlike other VPNs such as Tunnel Bear or NordVPN, PIA doesn’t have a windowed desktop application. You do need to log into a simple window panel, but as soon as that’s done it disappears and the application sits in the system tray. PIA’s icon is a little robot with a lock symbol. When a PIA connection isn’t active, the icon is red. Once you start connecting it turns gray, and when the connection is complete, the icon turns green. There are two ways to connect with PIA. You can simply click the icon when it’s red and PIA will either auto-select a server or reconnect to your most recently used server location. If you want to specify a location, however, right-click the PIA icon and choose from any of its 36 locations in 24 countries around the world. 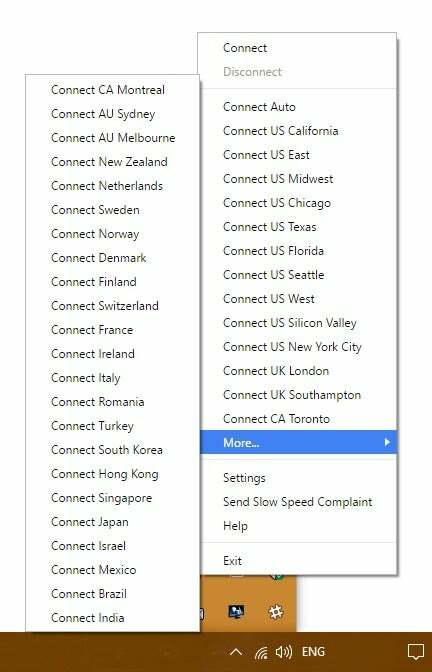 PIA doesn’t allow users to pick a specific server, instead limiting choices to either a country or a region in the United States, Canada, United Kingdom, and Australia. 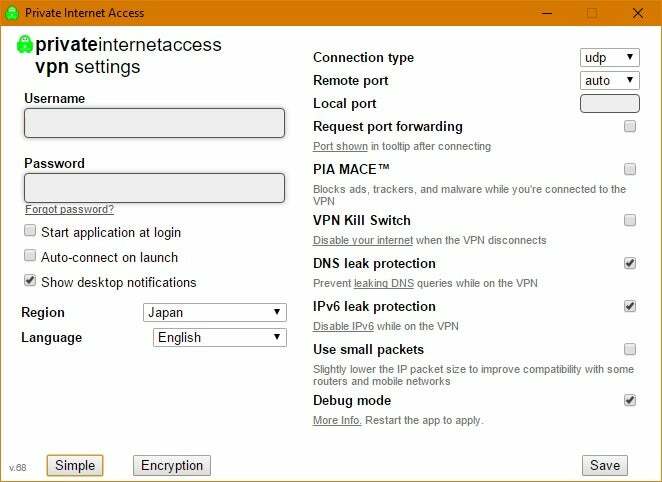 PIA is in many ways a no-frills VPN, but it does have a few features for power users. When PIA is on but not actively connected, right-click the icon and select Settings, and then when the small panel opens select Advanced at the bottom. Now the window expands to show PIA’s few extra features including DNS leak protection, IPv6 leak protection, a kill switch to stop internet traffic when your VPN connection dies, and an ad-tracker blocker called PIA Mace. As far as usability goes, PIA allows for five simultaneous device connections from a single account. It has applications for Windows, Mac, Linux, Android, and iOS. There’s also a Chrome extension, and help articles on PIA’s site discuss how to connect a router directly to the VPN. Overall, PIA’s speeds are good. The service ran an average of 36.44 percent over the base speed. That’s a respectable score with good speeds in most countries. The United Kingdom and Germany were notably strong while the rest were respectable. Update: This article was updated on July 17, 2017 with updated speed scores. The company also has some people who stand behind the company. While PIA itself doesn’t list the company’s address on its website, PIA’s parent company London Trust Media Holdings does. The company is based out of Denver, Colorado with a mailing address of 4643 S Ulster St. Suite 1120. PIA’s team is not listed on the site, but with a little quick digging I found Andrew Lee who is the chairman of PIA’s parent company, London Trust Media Holdings. The amount of information you supply to PIA depends on your payment method. Bitcoin users, for example, only need to supply an email address. Credit card payments, meanwhile, are processed by the company, meaning you must supply your name and address; however, it’s not realistic to expect a high degree of anonymity when you’re paying with a standard bank credit card. PIA has solid performance and a good reputation for keeping its user data private. The service’s simplistic interface may be too minimalist for users accustomed to windowed applications. Nevertheless, it’s a very good VPN. That said, anyone looking to view U.S. Netflix outside of the country will have to look elsewhere as this VPN does not officially support geo-unblocking.